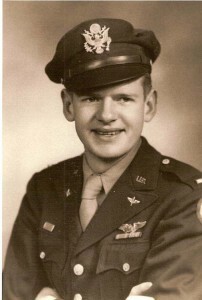 “Those of us who flew from the base were scarcely more than boys (I had my 21st birthday between my eight and ninth missions). We were overseas for the first time – far from loved ones at home. My wife Sally and I had been married less than four months when I arrived. In those days before cell phones or internet, even trans-Atlantic phones, we were almost completely isolated from our personal worlds so far away. What news we got came by mail on ships that took ten days or more to make the crossing. Mail came in batches with weeks between letters. On base we were afraid to make friends outside our own crew, such a friend might not make it back from the next mission. We were soldiers doing our jobs – nasty jobs, dangerous jobs, physically demanding jobs. But at heart we were civilians. Each of us was more centred on his own particular situation than on the war. The question foremost in our lives was: would we make it home tonight? On days when we didn’t fly, we would sit on our bunks and think about our situation. In all this we were lonely. When we left the base on a pass, we wanted to forget the war, flying and our troubles. We wanted to have fun. It was a way to relieve the tension. It was while off base letting off steam that we first met the people of Sudbury. Self-indulgent as we were, we thought very little about you – our hosts – about the suffering in your lives, your own privations. Remember we were very young, full of ourselves, oozing with testosterone. We were rude and crude to you. To us you were the foreigners. England had been something in a history book or a geography class. Despite our faults you indulged us, were kind to us and we began to realise that you were suffering just like us. You befriended us when we needed friendship. Our common meeting place was the pubs, There you talked and laughed with us. We learned to drink warm beer but, more importantly, we learned that a pub was a warm, friendly place, full of nice people not very different from our families back home. You greeted us on the street, in church, at the railway station. Base trucks brought girls to dances in our NCO club. Sudburians invited us into their homes. 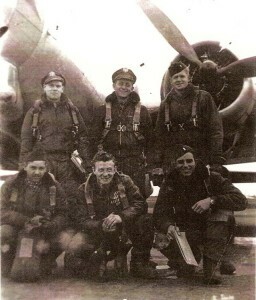 L to R: Front Hank Fulton, engineer; Ed Krawcyk, radio; Jack Crabtree, pilot; Rear Les Pleshke, mickeyman; Harry Barnes, co-pilot; Bob Harper, navigator. ”When groups from our Association came back to visit you treated us like royalty but each time we came there were fewer of us. The men of the 486th present and past are proud to say we were based in Sudbury. We are honoured too that you remember us. 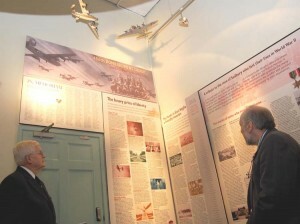 We are thrilled that the memory of the 486th is included this museum. Most of us have lived long productive lives. But it’s been 64 years since were left Sudbury and there are not many of us left. Only 22 of us attended our recent reunion. Where our association once had over 1,000 members there are now about 200 of us. We are here to honour not those of us who lived but those who didn’t make it through the war. Who lived or died was basically a matter of chance. When we flew into a solid carpet of flak over the target, flying straight and level until the bombs were dropped, it was inevitable that most planes and some men would be hit. Our planes were tough old birds, so that with a hole in the wing or in the tail structure or with just one engine hit we could make it home. Those hit in the fuel tanks or with their flying controls severed faced disaster. It was just a matter of chance who lived, who died. Bob Harper (left)just after the unveiling.